Fördjupa dig i smakerna och kulturerna av Côte de Nuits Burgundy Wine på den här 8 timmars smågruppen turnén från Beaune. Smaka på 12 viner medan du besöker Chateau du Clos Vougeot och två andra vingårdar. Kör den natursköna Grands Crus Route i en Mercedes minibuss med din lilla grupp med bara åtta personer eller färre. Ta dig till Beaune turistbyrå kl 9:30 (tisdag / torsdag) eller 9:00 (lördag). Klättra in i en minibuss med Mercedes med din lilla grupp med åtta personer eller färre och ställ dig ut för vinodlingslandskapet. Lyssna på din guides informativa kommentar när du kör genom det natursköna landskapet, genom Nuits-Saint-Georges, Vosne-Romanée och Vougeot. 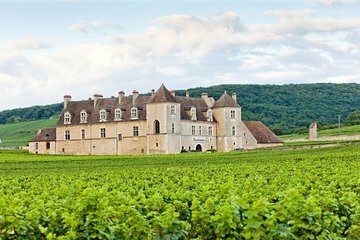 Tour Chateau du Clos Vougeot, grundad på 1100-talet av munkar och nu känd för sin Grands Crus. Därefter besöker du en familje domän för att åka underjordisk källare och smaka på sina produkter. Kör längs Grands Crus Road, stoppa på Romanée-Conti, som berömt producerar några av världens dyraste viner. Tillbringa de närmaste två timmarna på lokala fastigheter i Nuits-Saint-Georges för provningar och turer innan du återvänder till Beaune. The tour was awesome! Paul, our guide is so knowledgeable, knows everything about the region and the wines, and also very kind and welcoming. The tastings and visit to the vineyards was perfect to understand the climatsof Burgundy and a really good introduction to the wine regions. Strongly recommend. We had a thoroughly enjoyable day with our guide Simon and five other people. We had a lovely and very educational day learning about the wine-making process in the Burgundy. The beauty of the area is amazing, and we were able to taste some wonderful wines during the course of our tours. Simon was very knowledgeable and professional and I feel we will be much more confident in choosing Burgundy wines in the future. I highly recommend this tour if you are in the area. Très belle journée. Beaucoup appris! Accompagnateur compétent, cultivé et très sympathique. This was an outstanding tour, albiet my wife and I were the only ones signed up for the day. Our tour took us down the grand cru road, with plenty explanation to make a much more informed choice when I'm chosing a Burgundy in the future. The tour led to an excllent lunch, and two wine tastings. Fantastic tour, very informative, lovely wines , great meal at lunchtime. Relaxed and fun in a small group. Very good value. Excellent driver-guide, excellent lunch, really interesting day and some magnificent wines to taste. An amazing day in the beautiful Burgundy countryside. Our guide was fantastic - very knowledgeable of history of wine making / classifications in Burgundy as well as the general history of the area. Very informative tour which covered a diverse selection of wines from different estates. The tour guide Alexia is very knowledgeable and answered all our questions with detail and depth. The lunch was superb as well as the wines served up with the delicious meal. I would highly recommend this tour. This tour was excellent!! The tour guide Alexys Pardon me if I have spelled her name incorrectly was warm, professionall, prompt and exceptionally knowledgeable! No stone was left unturned, and was able to answer all questions. We had a fabulous lunch, and several superb wine tastings. Highly recommend this tour!